An original Cuban brand from the late 1800s, La Aroma de Cuba has been reborn in the house of legendary cigar-maker, Jose "Pepin" Garcia, in Estelí, Nicaragua. Precision blending of the finest, aged Nicaraguan tobaccos provides a consistent medium-bodied profile. Connecticut Broadleaf wrappers rouse rich hints of brown sugar and cool spice. Phenomenal earth and cedar notes endorse the bold, smooth finale. 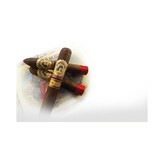 La Aroma De Cuba is a cigar brand that was well known for decades. Originally it was made in Cuba, and though you may not hear about it much anymore, arguably one of the most important figures in the history of England was a big fan; Sir Winston Churchill, the man who lead Britain through some of its darkest days and to some of its brightest victories in the face of a terrifying enemy. He was said to be fond of the cigars, and remained so until they were no longer available to him. The La Aroma De Cuba El Jefe is from the standard Aroma De Cuba line. Ashton cigars worked with Don Pepin Garcia, of My Father cigars fame, in order to revive the line and to keep the name and the history of La Aroma De Cuba alive, so that you can now go into your local tobacconist and enjoy a taste of that history. The tobacco for these cigars is grown in Nicaragua, and at the factory in Esteli, Nicaragua it is rolled into a fine cigar. The tobacco is all Cuban seed tobacco, and the wrapper is a Connecticut Broadleaf wrapper which provides a bit of oiliness and a bit more flavor. When ignited and cut, the cigar gives off notes of sweet cream, chocolate, and even hints of coffee toward the end. It’s a flavorful cigar that pairs well with most of the dinner options on the market, and that does a good job of reviving the name of La Aroma De Cuba. The El Jefe is the gordo offering, 7 inches long and with a 58 ring gauge. A fantastic cigar and at a great price.